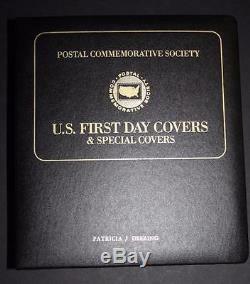 Postal Commemorative Society US First Day Covers & Special Covers Open Bind 158. First Day Covers and Special Covers - Open Bind. 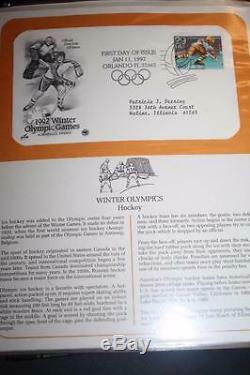 Winter Olympics Cover with 29¢ Hockey stamp. Winter Olympics Cover with 29¢ Figure Skating stamp and 29¢ Speed Skating stamp. 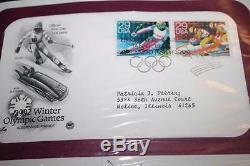 Winter Olympics Cover with 29¢ Skiing stamp and 29¢ Bobsled stamp. World Columbian Stamp Expo'92 Cover with 29¢ World Columbian Stamp Expo stamp. 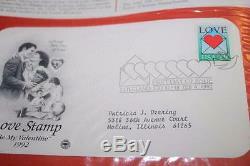 DuBois Cover with 29¢ W. 1992 Love Cover with 29¢ Love stamp. 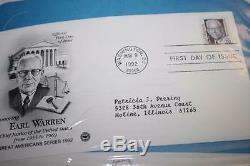 Earl Warren Cover with 29¢ Earl Warren stamp. 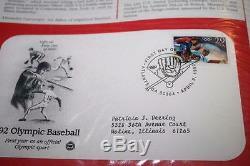 Olympic Baseball Cover with 29¢ Baseball stamp. 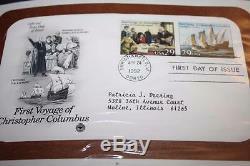 First Voyage of Christopher Columbus Cover with 29¢ Seeking Support stamp and 29¢ Crossing the Atlantic stamp. 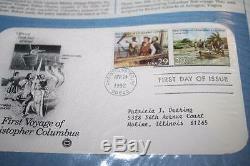 First Voyage of Christopher Columbus Cover with 29¢ Approaching Land stamp and 29¢ Coming Ashore stamp. Space Exploration Cover with 29¢ Astronaut stamp and 29¢ Cosmonaut stamp. Space Exploration Cover with 29¢ Apollo stamp and 29¢ Soyuz stamp. The Final Day of the Soviet Union Cover with 5k Final Day stamp. The Beginning of the New Commonwealth of Independent States cover with 5k New Beginning stamp. Kentucky Statehood Cover with 29¢ Kentucky stamp. 1992 Summer Olympic Games Cover with 29¢ Soccer stamp. 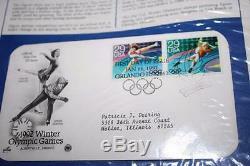 1992 Summer Olympic Games Cover with 29¢ Gymnastics stamp and 29¢ Volleyball stamp. 1992 Summer Olympic Games Cover with 29¢ Boxing stamp and 29¢ Swimming stamp. Hummingbirds Cover with 29¢ Ruby-Throated Hummingbird stamp. Hummingbirds Cover with 29¢ Broad-billed Hummingbird stamp and 29¢ Costa's Hummingbird stamp. Hummingbirds Cover with 29¢ Calliope Hummingbird stamp and 29¢ Rufous Hummingbird stamp. World War II Cover with 29¢ Raid on Tokyo stamp and 29¢ Deciphering Codes stamp. World War II Cover with 29¢ Rationing stamp and 29¢ Battle of Midway stamp. World War II Cover with 29¢ Coral Sea stamp and 29¢ Women Join War Effort stamp. World War II Cover with 29¢ Fall of Corregidor stamp and 29¢ Guadalcanal stamp. World War II Cover with 29¢ Aleutian Islands Invaded stamp and 29¢ Allies Land in North Africa stamp. Dorothy Parker Cover with 29¢ Dorothy Parker stamp. Theodore von Karman Cover with 29¢ Theodore von Karman stamp. Minerals Cover with 29¢ Azurite stamp and 29¢ Copper stamp. Minerals Cover with 29¢ Variscite stamp and 29¢ Wulfenite stamp. Wildflowers of America Cover with 29¢ Plains Prickly Pear stamp. Wildflowers of America Cover with 29¢ Moss Campion stamp. Wildflowers of America Cover with 29¢ Turk's Cap Lily stamp. Wildflowers of America Cover with 29¢ Indian Pond Lily stamp. Wildflowers of America Cover with 29¢ Trumpet Honeysuckle stamp. Wildflowers of America Cover with 29¢ Jacob's Ladder stamp. Wildflowers of America Cover with 29¢ Desert Five Spot stamp. Wildflowers of America Cover with 29¢ Dutchman's Breeches stamp. Wildflowers of America Cover with 29¢ Rue Anemone stamp. Wildflowers of America Cover with 29¢ Smooth Solomon's Seal stamp. Wildflowers of America Cover with 29¢ Wild Flax stamp. Wildflowers of America Cover with 29¢ Standing Cypress stamp. Wildflowers of America Cover with 29¢ Red Maid stamp. Wildflowers of America Cover with 29¢ Yellow Skunk Cabbage stamp. Juan Rodriguez Cabrillo Cover with 29¢ Juan Rodriguez Cabrillo stamp. Wild Animals Cover with 29¢ Giraffe stamp. Wild Animals Cover with 29¢ Giant Panda stamp and 29¢ Flamingo stamp. Wild Animals Cover with 29¢ King Penguins stamp and 29¢ White Bengal Tiger stamp. Christmas 1992 Cover with 29¢ Engine stamp and 29¢ Steamship stamp. Christmas 1992 Cover with 29¢ Horse stamp and 29¢ Train stamp. Christmas 1992 Cover with 29¢ Madonna and Child with Saints stamp. Happy New Year Cover with 29¢ Happy New Year stamp. Elvis Presley Cover with 29¢ Elvis Presley stamp. Space Fantasy Cover with 29¢ Saturn Patrol stamp. Space Fantasy Cover with 29¢ Cities of Explorers stamp and 29¢ Explorers in Flight stamp. Space Fantasy Cover with 29¢ Space Station stamp and 29¢ Neptune Patrol stamp. 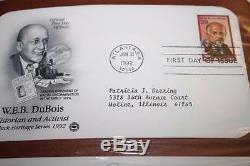 Percy Lavon Julian Cover with 29¢ Percy Lavon Julian stamp. Ellis Island Cover with 19¢ Ellis Island Postal Card. 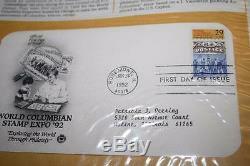 Columbia River Gorge Cover with 19¢ Columbia River Gorge Postal Card. America's Cup Cover with 19¢ America's Cup Postal Card. Americans with Disabilities Cover with 29¢ Americans with Disabilities Stamped Envelope. The White House Cover with 29¢ 200th Anniversary stamp. Pledge of Allegiance Cover with 29¢ 100th Anniversary stamp. Presorted First Class Coil Stamp Cover with 10¢ Canal Boat stamp and 23¢ Presorted stamp. Eagle and Shield ATM Stamp Cover with 29¢ Eagle and Shield stamp. Computer-Vended Variable-Rate Stamp Cover with 29¢ Variable-Rate stamp. Bulk Rate Stamped Envelope Cover with 19.8¢ Bulk Rate Stamped Envelope and 10¢ Canal Boat stamp. Protect the Environment Cover with 29¢ Protect the Environment Stamped Envelope. Western Americana Cover with 29¢ Western Americana Stamped Envelope. Consular Service Cover with 52¢ U. Consular Service Cover with 75¢ U. Oregon Trail Cover with 29¢ Oregon Trail stamp. Grace Kelly Cover with 29¢ Grace Kelly stamp. International College Sports Festival Cover with 29¢ World University Games Buffalo stamp. Circus Cover with 29¢ Aerialist stamp and 29¢ Elephant stamp. Circus Cover with 29¢ Clown stamp and 29¢ Big Top Showman stamp. Cherokee Strip Land Run Cover with 29¢ Cherokee Strip stamp. Thomas Jefferson Cover with 29¢ Thomas Jefferson stamp. Dean Acheson Cover with 29¢ Dean Acheson stamp. Sports Horses Cover with 29¢ Thoroughbred Racing stamp and 29¢ Steeplechase stamp. Sports Horses Cover with 29¢ Harness Racing stamp and 29¢ Polo stamp. Garden Flowers Cover with 29¢ Hyacinth stamp. Garden Flowers Cover with 29¢ Daffodil stamp and 29¢ Tulip stamp. Garden Flowers Cover with 29¢ Iris stamp and 29¢ Lilac stamp. World War II Cover with 29¢ Allied Forces Battle German U-Boats stamp and 29¢ Italy Invaded by Allies stamp. World War II Cover with 29¢ Military Medics Treat the Wounded stamp and 29¢ Bonds & Stamps Help War Efforts stamp. World War II Cover with 29¢ Sicily Attacked by Allies stamp and 29¢ Military Humor Keeps Spirits High stamp. World War II Cover with 29¢ B-24s Hit Ploesti Refineries stamp and 29¢ Gold Stars Mark World War II Losses stamp. Hank Williams Cover with 29¢ Hank Williams stamp. Rock & Roll/Rhythm & Blues Cover with 29¢ Elvis Presley stamp. Rock & Roll/Rhythm & Blues Cover with 29¢ Buddy Holly stamp and 29¢ Dinah Washington stamp. Rock & Roll/Rhythm & Blues Cover with 29¢ Ritchie Valens stamp and 29¢ Otis Redding stamp. Rock & Roll/Rhythm & Blues Cover with 29¢ Bill Haley stamp and 29¢ Clyde McPhatter stamp. Broadway Musicals Cover with 29¢ Oklahoma! Stamp and 29¢ My Fair Lady stamp. Broadway Musicals Cover with 29¢ Show Boat stamp and 29¢ Porgy & Bess stamp. National Postal Museum Cover with 29¢ Benjamin Franklin stamp and 29¢ Binding the Nation stamp. Joe Louis Cover with 29¢ Joe Louis stamp. Deaf Communication Cover with 29¢ "I Love You" Sign Language stamp and 29¢ Deaf Mother Signing I Love You to Baby stamp. Country & Western Music Cover with 29¢ Hank Williams stamp and 29¢ Patsy Cline stamp. Country & Western Music Cover with 29¢ The Carter Family stamp and 29¢ Bob Wills stamp. Christmas 1993 Cover with 29¢ Madonna and Child in a Landscape stamp. Christmas 1993 Cover with 29¢ Red-Nosed Reindeer stamp and 29¢ Jack-in-the-Box stamp. Christmas 1993 Cover with 29¢ Toy Soldier stamp and 29¢ Snowman stamp. Some stamps may not be shown due to image limits. 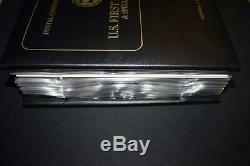 Please review the photos and description closely for the condition of our available items. Please let us send you a combined invoice before paying. We have a well-rounded inventory with everything from. 75 cent BU State quarters to an 1893-S Morgan Dollar and everything in between. We also have a full product line of coin supplies. Get Supersized Images & Free Image Hosting. Create your brand with Auctiva's. Attention Sellers - Get Templates Image Hosting, Scheduling at Auctiva. The item "Postal Commemorative Society US First Day Covers & Special Covers Open Bind 158" is in sale since Friday, June 2, 2017. This item is in the category "Stamps\United States\Collections, Lots". The seller is "coinguy5488" and is located in Moline, Illinois. This item can be shipped to United States, Canada.